Nice blog post. I am also guilty of spending a few minutes playing Pacman on Google’s website. But I agree with you that Google was not only creative in paying tribute to Pac-Man’s 30th anniversary but that it also afforded all of us a chance to reminisce and also pay tribute to Pac-Man. Cheers! It was great listening to the Pac-Man music again, and remembering the times I used to play it as a child. Good times. I don’t know what to call it … synchronicity may be? I just published a post about productivity that was triggered by the same thing: Pac-Man on Google. We share the same views. We just express them differently. The only thing I would partially disagree with is your point about evasion. Sometimes it can be the best thing you do. If you’re stuck and can’t seem to find a way out when dealing with an issue, doing something completely unrelated (or even mindless) might inspire you. Manal´s last blog ..Are You OK With Being Invisible? I fully agree with your disagreement. I think it’s very healthy to take breaks (i.e. look away) from a challenging problem in order to develop perspective, and potentially find solutions you’d not be able to reach while staring your problem in the face. The evasion I’m critical of is the idea that if you don’t face your problem, it will somehow go away. That “out of sight, out of mind, out of existence” attitude to life. Stepping back is very different from running away. And I see I missed TWO posts on your blog! Heading there now! Thanks for agreeing with my disagreement Haider. I understand what you mean. We have to face the music and deal with certain situations. Escaping in this case compounds the problem. Hi Haider — I like that way of putting it — that productivity is really about having choice around the way you use your time, rather than spending the day running away from thoughts and sensations you’d rather not experience, or giving into any urge that comes up in the moment. Yes. Evasion is the devil. We find liberty (and productivity) through awareness and exercising choice. Thanks for stopping by, and picking out the most important point out of the article. I found your name in aliventure and as soon I saw your photo, I knew you are from the Gulf countries It is always good to interact with people from my own region. In regards to the tips you offer, thanks a lot for them. Dia´s last blog ..What should I do with my life? Tis great to connect with you too! We’re a minority in the personal growth community. Thank you for your feedback, and for reaching out. Farouk, I was checking your site out yesterday! Thanks for passing by, and hope to connect more with you on the blogosphere! 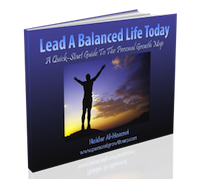 Subscribe to the mailing list to receive your free copy of Lead A Balanced Life Today, and more tips on how to achieve your goals in every area of your life. 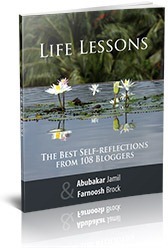 A collection of life lessons from 108 bloggers (including a wise man named Haider). Twitter links powered by Tweet This v1.6.1, a WordPress plugin for Twitter.